At Sibudu Cave we find record of prehistoric human occupation which dates back 77,000 years ago or even much longer. It is a rock shelter in a sandstone cliff situated in northern KwaZulu-Natal in South Africa. 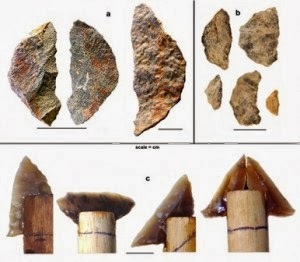 It shows evidence of some of the earliest examples of modern human technology, the spears date back 400,000 years, the bone arrows around 61,000 years old, the use of heat treated mixed compound gluing to 72,000 years, an example of bedding around 77,000 years and the needle 61,000 years old. 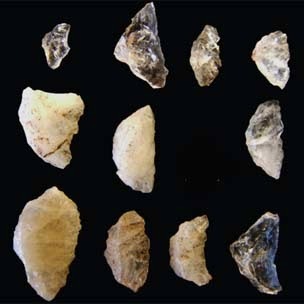 The complexity of creation and processing in glues and bedding is of great interest and has evidence of continuity between the early human cognition and the present humans. 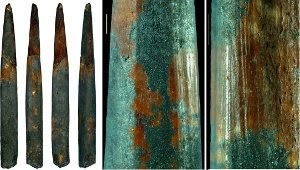 Besides the spears and arrows, they also have sophisticated stone tools as well as skillfully made bone implements, deep hearths, charred bones of big and small mammals, blocks of red ochre as well as sparkling ornamental beads made from shells of sea snails, bedding made of sedges and grass and other monocotyledons together with some aromatic leaves containing insecticidal and larvicidal chemicals while the leaves from Cryptocarya woodii Engi when crushed were aromatic and had traces of a-purones, cryptofolione and goniothalamin which are useful as insect repellant. Sibudu Cave being a rock shelter is located roughly 40 km north of the city of Durban and around 15 km inland near Tongaat town. Its steep forested cliff faces WSW which overlooks the Tongati River which presently is a sugar cane plantation. Due to erosion of the Tongati River, this shelter was formed and it now lies 10 m below the shelter and its floor is 55 m long and around 18 m wide. The shelter has a large collection of Middle Stone Age deposits which are well preserved organically and dated accurately using optically stimulated luminescence. 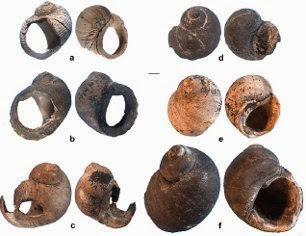 The occupation at Sibudu is divided into pre Still Bay between 72,000 - 71,000 BP, Howieson Poort before 61,000 BP, post Howiesons Poort in 58,500 BP, and late 47,700 BP and finally the Middle Stone Age era in 38,600 BP with occupation gaps of almost 10,000 years between the post Howiesons Poort and the late Middle Stone Age era and the late and final Middle Stone Age period. The occupation during pre Still Bay had lithic flake based industry which made few tools and in addition to flakes, made bifacial tools and points where the tips of the points shows evidence of compound adhesives on their base when they were hafted and shafted. The Howiesons Poort occupation made blade tools which were shaped like the segment of an orange with sharp cutting edges on the straight lateral with a blunted and curved back. These were attached to handles with ochre and plant adhesive or fat mixed with plant material. The segments were made with a cutting edge all along the length which needed to be attached to their hafts without the need of twine and hence strong adhesive glue was essential. 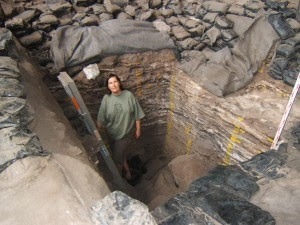 Discoveries show that there were dry phases and the shelter was occupied only during wet climate. The first excavation after its discovery was carried out by Aron Mazel of the Natal Museum in 1983 an unpublished work and Lyn Wadley of the University of the Witwatersrand began a renewed excavation in September 1998.